At that time Jesus came from Galilee to the Jordan River. Jesus came to John and wanted John to baptize him. But John tried to say that he was not good enough to baptize Jesus. John said, "Why do you come to me to be baptized? I should be baptized by you!" 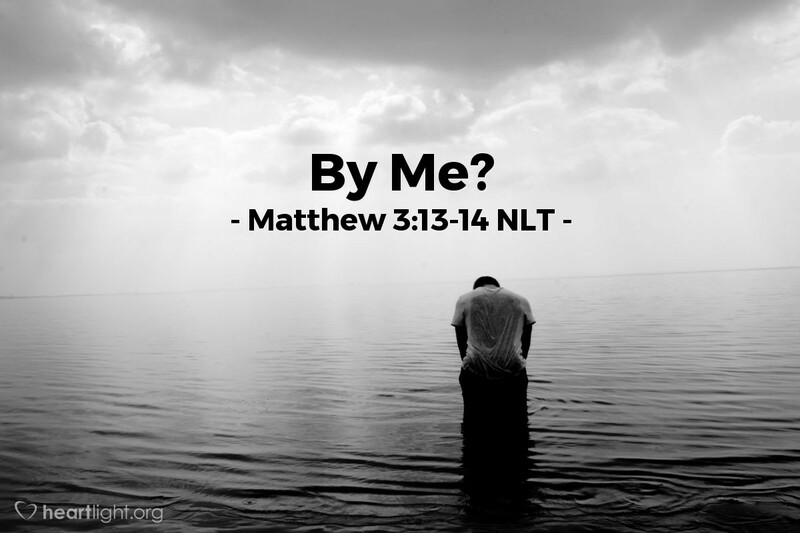 Can you imagine John's surprise when Jesus wanted to be baptized by him? "I'm not worthy..." "I need to be baptized by you..." But, even when God shows us a way that may seem strange to us, He has a plan and it works beautifully if we will all do our part. So often, God's great leaders had to walk much of their journey alone because no one dared to help them. Discipleship is not just about great leaders, but also about loyal followers—followers of Jesus who do their part when given the opportunity and followers who dare to imagine that God wants to use them in mighty ways for his Kingdom. O Great Giver of Gifts, thank you for giving me a part to play in your work of salvation. Help me to never underestimate the importance of what you have called me to do to serve you, nor devalue the abilities you have given me to use in your service. I want to fulfill your plans for my life and ministry, so please give me the courage and boldness to seize the opportunities to serve you that you place before me. In Jesus' name I pray. Amen.